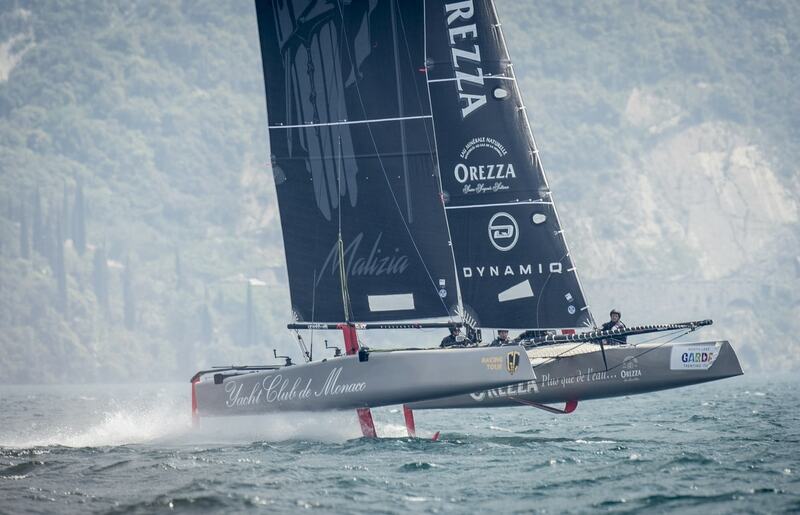 In 2016, the Yacht Cub Monaco founded a new project: GC32 Racing Team Malizia, skippered by Pierre Casiraghi. Pierre and Boris have been sailing together in various projects as Maserati and Esimit Europa. The crew includes former America’s Cup helm Sebastien Col, plus British multihull ace Adam Piggott and Richard Mason. Supervising them is Pierre-Alexis Ponsot, a French Olympic team member with a clutch of victories in the Tour de France à la Voile under his belt. With top speeds at about 40 knots, the GC32 means pure, exciting sailing, but also a maximum of physical exhaust. Team Ma has just finished their first event on Lake Garda, competing against against eight international teams, some from the America’s Cup like Franck Cammas (Team France), Iain Percy (Artemis) and Glenn Ashby (Team New Zealand). Indeed, the end result for the Monegasque GC32 is more than positive with 19 races completed over an intense very windy four days, this being the first of five stages on the 2016 circuit. The crew on Malizia even set their own speed record on the Saturday, topping out at 38.4 knots in the first race of the day which they won, to which can be added two third places.